Music News: Katy vs. Gaga – let the battle begin! Katy Perry’s new single “Roar” is out and already rockin’ iTunes! Due to several leaked snippets, Gaga pushed up the release of her new single “Applause” to tonight! Let the pop girl battle begin! Strangely enough, both “Roar” and “Applause” suffer from the same problem – strong chorus, weak verses. Katy’s verses are familiar and cliche (“You held me down, but I got up!”), Gaga’s just don’t make a ton of sense. But while “Roar” features the most massive and infectious chorus I’ve heard in a pop song this year, Gaga’s “Applause” just has a solid hook…buried beneath a lot of electronic noise. Advantage: Katy. I LIKE “Roar” a lot, but I don’t LOVE it. Vocally, Katy’s never sounded better, but the song is missing the spark (pardon the pun) of past anthems like “Firework” (though the final chorus is really something special). As for “Applause,” it’s OK. Like a lot of songs on “Born This Way,” the production just sounds too cluttered and messy to me. Katy’s been sitting at #1 on iTunes for a few hours today, but I imagine she will be dethroned by Gaga later tonight. Then, after the hype settles, we’ll see which song is really resonating with the general public! 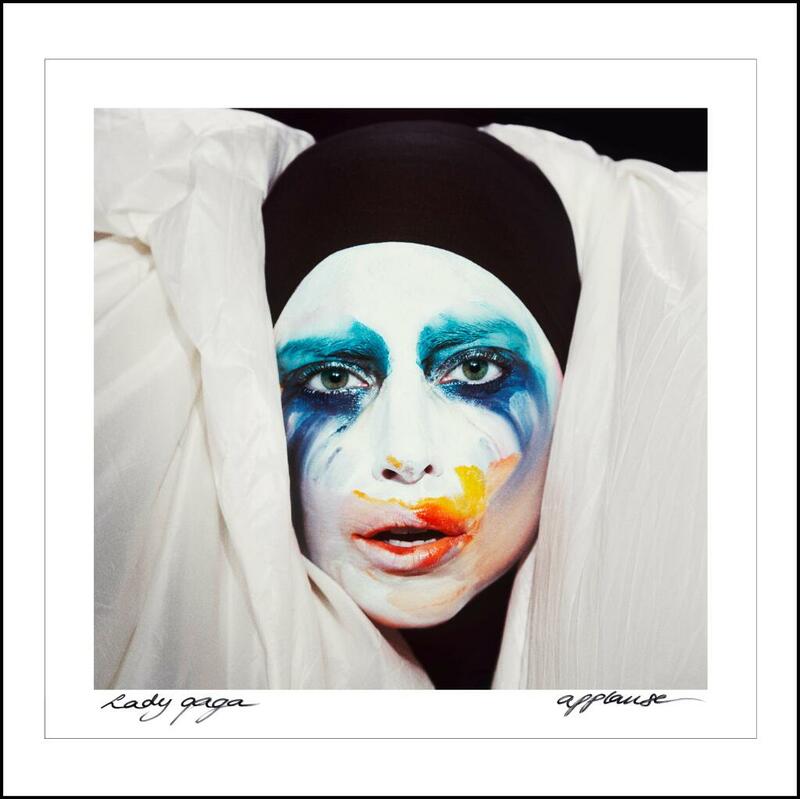 What are your thoughts on “Roar” and “Applause”? Which song will ultimately come out on top? Music News: Nicki Minaj to collab with Miley Cyrus? In demand producer Mike Will (aka Mike WiLL Made It) posted a picture on Twitter this morning of him hanging out in the studio last night with Miley Cyrus and Nicki Minaj. Hmm, is a collab in the works? I could potentially be interested in a Miley and Nicki track (as long as Miley lets Nicki do all the rapping). Miley recently announced that her upcoming studio album will be called, “Bangerz.” Yes, that’s “Bangerz” with a Z, not “Bangers” with an S. Miley’s Mike WiLL Made It produced lead single, “We Can’t Stop” is currently sitting in the #2 spot on the Billboard Hot 100. Katy Perry’s new single “Roar” went up for pre-order on UK iTunes this afternoon, giving the world its first look at the song’s official artwork. And it’s hilarious. Framed in purple tiger print, Katy looks over her shoulder, really allowing us to appreciate the giant roaring tiger decal on the back of her track jacket. What words does the picture bring to mind? Regal. SUBTLE. Tasteful. EXPENSIVE. Just kidding, the single cover looks cheaper than free and it’s impossible to take Katy seriously in that tacky getup…but I can’t help but love it. True, Katy’s sending a bit of a mixed message – is this her more mature era, or are we still playing dress-up? But I don’t really care. Honestly, I just like that Katy’s still having fun. 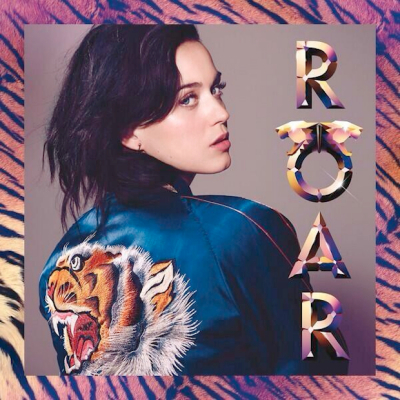 What do you think of Katy’s “Roar” cover art? Katy Perry continues to shed her candy-coated image with two new teaser videos for her upcoming single “Roar.” The first teaser finds Katy attending a funeral service for the famous peppermint dress that she wore on her California Dreams tour. 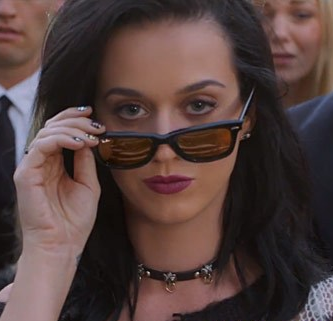 As the camera pans over the crowd of mourners, Katy tilts her sunglasses and gives us a knowing smirk (scandalizing the woman to her right). The second teaser, released this morning, follows an innocent looking fluffy cat as it pounces on and devours a feathery bird toy, letting out a ferocious roar when it’s through (Katy’s fans are called “Katycats,” if you weren’t already aware). But then the best part of the teaser happens – a five second song snippet!! We don’t get to hear much, but apparently “Roar” will feature a massive, ultra catchy chorus of, “Oh-oh-oh-oh-oh-oh-oh-oh-oh” ‘s. Seriously, it’s stuck in my head already. I was a little surprised by the song’s tempo – with a title like “Roar” I was expecting something a little peppier – but I will put my trust in Katy, Dr. Luke, and Max Martin. I’m so hyped for this single I could spit. Too bad we still have five days to wait! Check out both of Katy’s new “Roar” teasers after the jump. 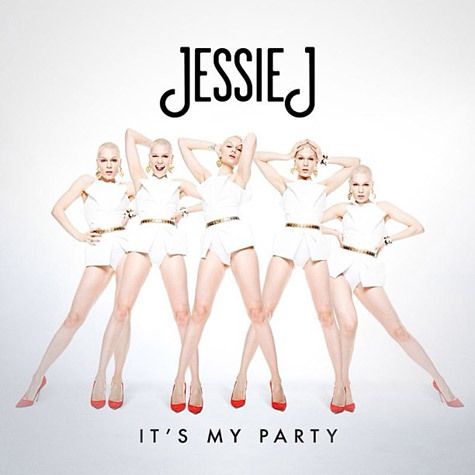 “It’s My Party,” the second single from Jessie J’s still untitled sophomore studio album, isn’t bad per se, it just doesn’t offer anything new. 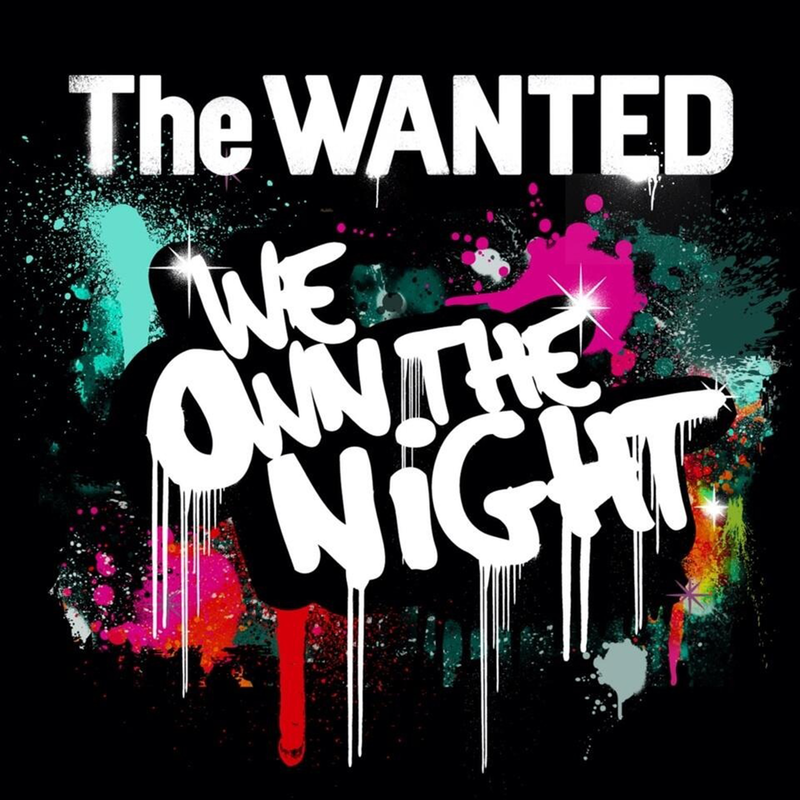 Empowering lyrics about being yourself/partying? Check. Funky guitars and a 4/4 beat? Check. Jessie’s shrill vocal acrobatics? Triple check. Sure, the chorus is catchy, but this could have easily appeared on Jessie’s last album, “Who You Are.” Ironically, I’m not sure Jessie knows who she is yet. Check out “It’s My Party” below. What do you think of Jessie’s latest offering? Gaga’s playing the role of a killer mime who appears in your bathroom mirror when you shut off the lights and chant its name 3 times in the official artwork for her new single, “Applause.” You’ve gotta hand it to Gags. When I first saw the image, I BURST out laughing. I doubt that’s the reaction she was going for, but hey, it’s certainly more interesting than your typical glamour shot. We’ve come to expect the unexpected from Gaga. Just when we thought we had the imagery for her whole “Born This Way” era figured out (horns, giant eggs, etc. ), she gave us an album cover that featured her screaming head mounted on a mean looking motorcycle. Now, for her big comeback single, she’s decided to pose as a killer mime. In a brand new interview with Women’s Wear Daily, Gaga describes “Applause” as “very fun” and “full of happiness.” This terrifying picture hardly fits those descriptions, but I guess I’ll have to wait until I hear the single on August 19th to pass final judgement. What do you think of Gaga’s new single cover? Scary or horrifying?